When shopping for kitchen cabinets, there are numerous factors to consider for finding the best cabinets for both your space and budget. Let the experienced professionals at Bargain Outlet help you with making a decision about cabinets to best serve your needs. With 37 locations, there is bound to be a location near your home. Style: When doing a kitchen remodel, you’ll want to choose a style that isn’t too trendy, so it will remain a classic for years to come. Similarly, you should select a color complementing your room’s color palette, keeping in mind that lighter color cabinets will brighten a space and make it feel larger, while darker finishes can make a room feel smaller. Price: Budget is a major concern, with cabinets running a range of prices, depending on materials, style, and functionality. Cabinets, including extra organizational features, for instance, will have a higher price than standard models. Construction & Materials: Cabinet materials include solid wood, particle board, MDF (medium density fiberboard), plywood, metal, or laminate. You won’t want to sacrifice quality construction to save some money, so choose wisely. 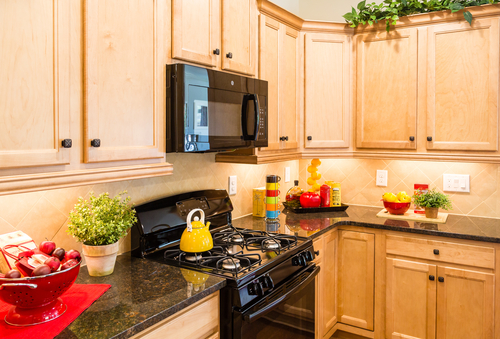 Layout: If you are replacing your current cabinets and want to retain the same general layout, it’s relatively easy to shop for what you’ll need. If you’re changing the layout significantly, take into consideration the number of additional cabinets you will need for the design. With so many factors to consider when buying kitchen cabinets, it’s best to turn to a professional for assistance. The experts at employee-owned Bargain Outlet can help make your decisions easier, with free kitchen designs and estimates. Visit the Bargain Outlet website to locate a store near you, and learn how to get started with your kitchen home improvement project.